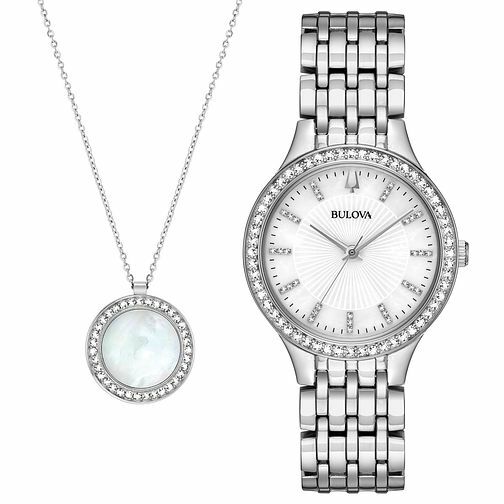 A sensational ladies' stainless steel watch adorned with 89 Swarovski® Crystals to illuminate the bezel and white mother-of-pearl three-hand dial. Flat mineral crystal, deployant closure, quartz movement, and water resistance to 30 metres. Complete with a co-ordinating mother-of-pearl and stainless steel pendant, encircled by 35 Swarovski® Crystals. A sparkling set to shine at all occasions.